Visit our Store for Blue Whale Gift Items. At the ocean's surface, a 27 foot high, slender, vertical blow reached toward the sky. As the 100 foot long body of the blue whale begins to descend, it reflects many shades of blue. As sunset fades to twilight and night, the color of the whale turns from shades of yellow to orange, pink, lavender, gray and black. 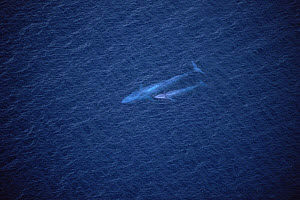 The mottled back of the blue whale, due to its uneven skin pigmentation, reflects many color changes throughout the day. This coloring may help it avoid detection by the krill upon which it preys. 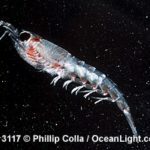 The largest animal to ever inhabit the planet feeds almost exclusively on one of the smallest animals -- shrimp-like krill. A blue whale can ingest up to eight tons of krill per day, and it has 55 to 68 ventral grooves extending at least to the navel. These throat grooves expand to accommodate 40 to 50 tons of water and krill. The pouch, when filled, is the size of a large living room. When a blue gulps a mouthful of food, it is so fast that camouflage may not even be necessary. Speed was the key feature that protected the blue whale until about a hundred years ago when hunters obtained fast catcher boats and exploding harpoons. The yellow coloration on its belly accounts for another of its names, "sulphur bottom," and is caused by diatom accumulations formed during long stays in cooler waters. Richard Sears and his colleagues studying blue whales in the Gulf of St. Lawrence, Quebec, Canada, have been able to identify individual blues by the mottled pigmentation patterns on their backs. Both sexes become sexually mature at 10 years of age at which time males are 67 feet and females are 72 feet. Females give birth to a single calf, 21 feet in length, every two or three years following a 12-month gestation period. The baby drinks 50 gallons of milk a day and is weaned at approximately eight months when it is 50 feet long and weighs about 50,000 pounds. 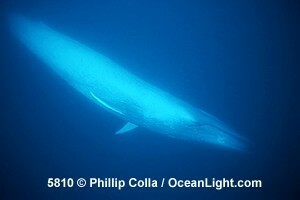 Blue whales are solitary animals, sometimes encountered in pairs, and they range throughout the world's oceans. Humans have done the most damage to this magnificent animal, almost driving it to the brink of extinction. Blues have had complete protection by international agreement since 1965. Yet the three main populations have depressed numbers. It is estimated that of the more than 5,000 that inhabited the North Pacific, only 1,200 to 1,700 are left. Only a few hundred are thought to survive in the North Atlantic, and of the 20,000 in the southern hemisphere in the 19th Century, about 9,000 remain (half of which are pygmy blue whales). 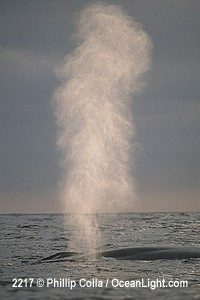 Blue whale blow can be 25 feet tall! 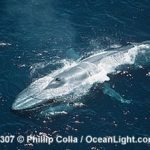 Blue whales are seen with some regularity in at least three areas: the coastal canyons off central and southern California; far inside the Gulf of St. Lawrence; and at the whaling grounds for fin whales in Denmark Strait. Because of precariously low numbers, this whale is particularly vulnerable to habitat degradation and overfishing of its main food source, krill. A story about the merciless slaughter of blue whales was the inspiration that led to the formation of Save the Whales in 1976. Baleen exposed in the mouth with strands of kelp caught in it. 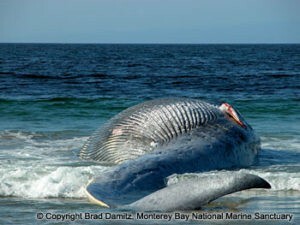 A young female blue whale had probably been dead for one to two weeks when she washed ashore at Del Monte Beach near Monterey , California in early October 2004. An effort will be made to determine the cause of her death. A nighttime necropsy done on the bloody carcass revealed that the whale's stomach was empty. This only proved that she had not eaten in at least two days. Researchers were led by Professor Jim Harvey of the Moss Landing Marine Laboratories. This was the first chance by many of the researchers and volunteers to see a blue whale up close. The juvenile whale's skull and jawbones will eventually be put on display at the Marine Laboratories. Side view with the pectoral fin clearly visible. Pieces of blubber carved off the carcass were buried on the beach. Tests on the blubber's thickness, as well as tests of fat content, may help to determine if starvation was the cause of death. 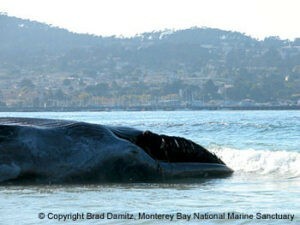 The rest of the 40-foot carcass will be towed 32 miles offshore and sunk in the 9500 foot deep Monterey Canyon. The necropsy also showed infection by a type of parasite. Marine mammals typically have many parasites, even though they may be healthy. Professor Harvey suggested that the whale may have been infected by domoic acid, a naturally occurring neurotoxin that has been killing sea lions, otters and dolphins along the California coast. No one has documented domoic acid poisoning in blue whales, said John Calambokidis, a blue whale expert who is associated with the Cascadia research collective based in Olympia , Washington. One of our recent newsletters contained an article (see below) about two new species of worms that devour whale bones. Observations can now be made on how quickly they begin to work on a fresh carcass. A good look at the ventral pleats on the underside of the whale. These expand when the whale feeds on large schools of krill. Save The Whales has a small piece of blue whale baleen and a very large vertebrae presumed to be from a blue whale. The U.S. Government confiscated them from members of the public as they are from an endangered species. Permission was given to Save The Whales for their use. These artifacts are displayed in our hands-on outreach program, Whales on Wheels WOW™. 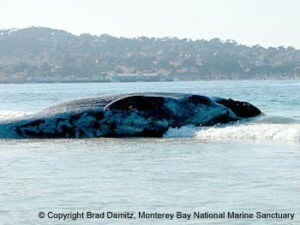 Two new species of worms have been discovered living on the bones of dead whales in California’s Monterey Bay. The strange worms do not have eyes, stomachs or even mouths. The discovery was made about 9,400 feet below the surface. Robert Vrijenhoek, of the Monterey Bay Aquarium Research Institute, said that the worms have colorful, feathery plumes that serve as gills and green “roots” that work their way into the bones of dead whales. They range from 1 inch to 2-1/2 inches and digest the fats and oils in the whalebones. Researchers named the worms a new genus Osedax or Latin for bone eating. At first, researchers could not determine what kind of creature they had discovered. They concluded that the most recent common ancestor lived around 42 million years ago, or about the same time that whales first evolved.